Whether you’re into (American) Football or not, you’re sure to hear a lot of people talking about this Sunday’s Super Bowl on Facebook. If you want to stay up to date with the latest news on the game, Facebook has a new page for you. The company is introducing a dedicated hub for Super Bowl XLIX – it’s basically a slightly amped-up “Trending” page, showing the latest comments on the game from both your friends and all around Facebook, in addition to related articles and photos from new outlets and people at the event. There are a couple of neat touches too though. 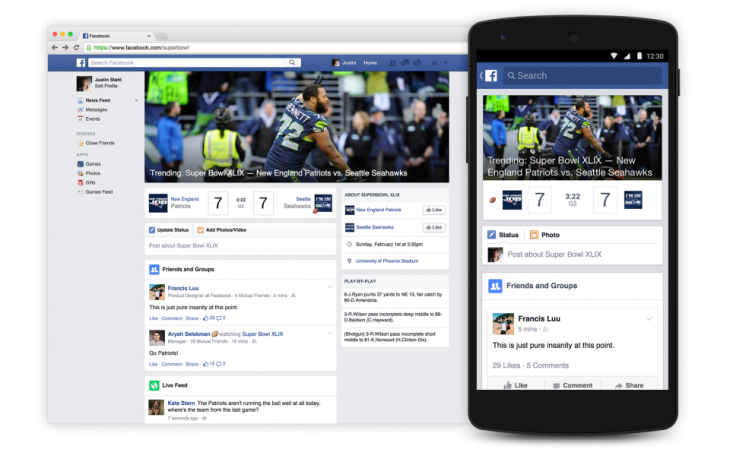 You’ll be able to see the game’s score and update with your best reactionary statuses right from the page – posts are automatically tagged with “watching Super Bowl XLIX.” You’ll also see related trends and scoreboards for the games leading up to the big showdown on the right-hand side. Head on over to Facebook.com/superbowl if you want to check the hub out.